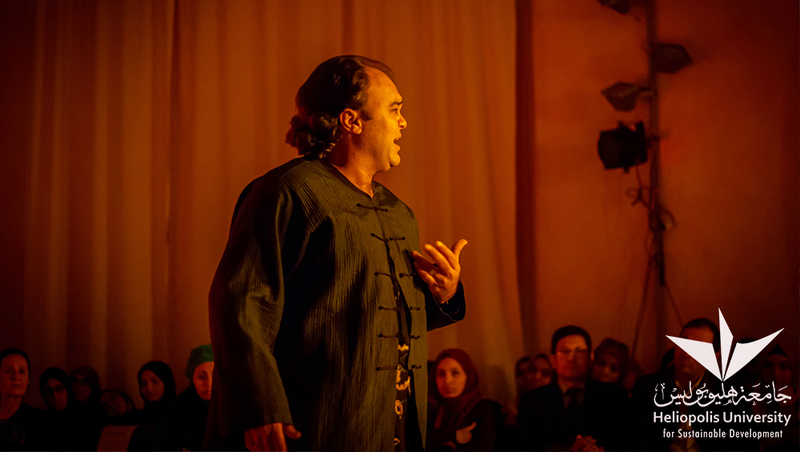 Almost two years after the theatrical production “Hulm”, a new artistic performance recently was performed in the Space of Culture: “Shakespeare Meets Scheherazade” or “The night I met William Shakespeare”, a fable which revealed a combination of the art storytelling and playwriting. Again, orient and occident were fused together. This time, two icons of the western and eastern literature were embodied: William Shakespeare, the well-known English poet and playwright, and Scheherazade, one of the main characters and storyteller of the famous Oriental book “One Thousand and One Arabian Nights”. Especially interesting was the fact that the two characters did not only come from different cultures – which was among others reflected by staging the play in English and Arabic – but lived in different eras as well. Tamer El Gazzar from Heliopolis University staff performing “Macbeth”. The show started with Scheherazade’s brilliant style of storytelling – exactly as she did it with her husband King Shahryar, as mentioned in the “Arabian Nights” book. Scheherazade captured the King’s imagination with her exciting tales, so that she was not killed. Her talent saved her life, as King Shahryar murdered all women that he married every day new after he was betrayed by his first wife. Dorothea Walter from Heliopolis University staff playing the role of Scheherazade with English speaking. She also performed “Lady Macbeth”. However, in “Shakespeare Meets Scheherazade” the female main character did not only narrate her famous stories, but also opened the gate of imagination by retracing “the lost story: the night I met William Shakespeare”. It was the night when they met and explored each other’s artworks. It was like a journey, which took the audience from Shahryar, to Shakespeare’s Macbeth, to the One Thousand and One stories, through our world today. A very special feature of the play was that most of the took place between the spectators. Elements like candle light or integrating a puppet show made the atmosphere even more impressive. Hamada Shosha and Heba Abdelrazek from Heliopolis University: Shakespeare and Scheherazade. The Egyptian director and writer Effat Yehia directed the performance in cooperation with co-workers of Heliopolis University. In the plot, she highlighted the humanistic meanings behind Shakespeare’s tragedies as well as Scheherazade’s struggle. 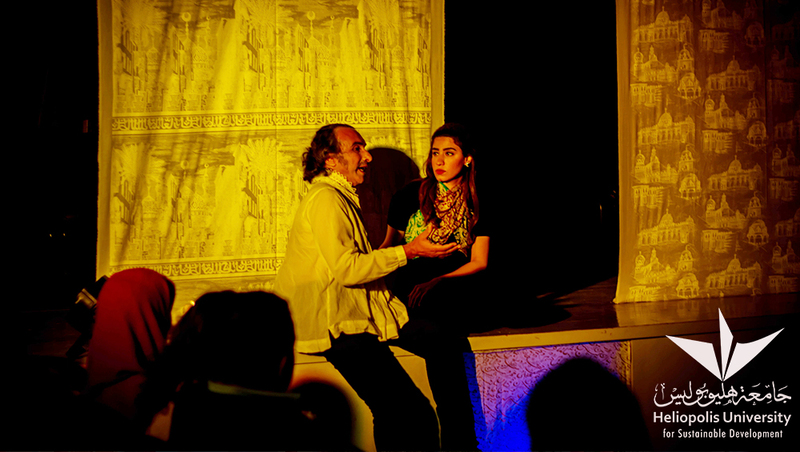 With Shakespeare’s scripted questions to Scheherazad, Effat also revealed the controversy of some literature critics that Shakespeare was inspired by the oriental tradition, in particular by “One Thousand and One Arabian Nights”. The very special and elaborate performance was presented by Heliopolis University as a new release from the production series Beit El Hekma (House of Wisdom), which was opened by “Hulm”. The name is inspired by the “House of Wisdom” in Baghdad, which was in the 18th century the center of sciences. 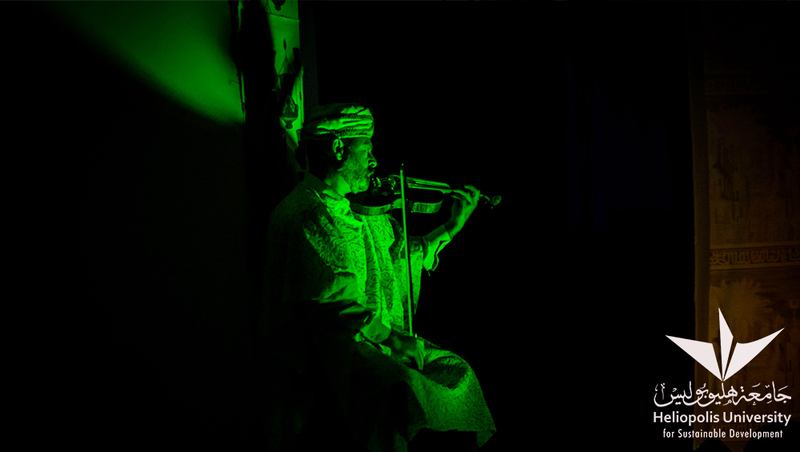 In this context, all artistic performances are connected to a revival of cultural exchange between East and West. 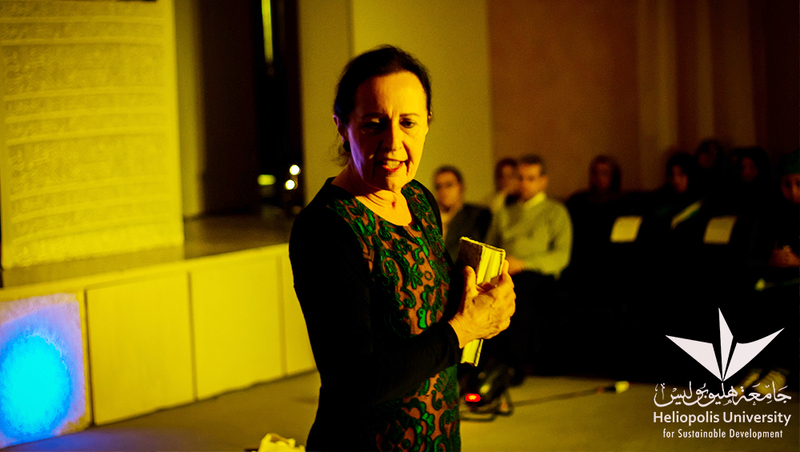 “Shakespeare Meets Scheherazade” was such a success that people asked to show the play again. Hence, Heliopolis University offered three further performances within one month.